Army Corps Makes Tough Calls With Floods The decision last week by the U.S. Army Corps of Engineers to blast a levee in southeast Missouri has drawn criticism. When it comes to floods, actions by the Corps bring controversy. When the Army Corps of Engineers blasted part of a levee holding back the Mississippi River last week, floodwater poured over Missouri farmland and surrounded this farm near New Madrid, Mo. To handle all of the water flowing down the Mississippi River, the Army Corps of Engineers is opening the floodgates on a spillway north of New Orleans. Opening the Bonnet Carre spillway diverts some of the floodwaters into Lake Pontchartrain and from there to the Gulf of Mexico. But nearly every flood control action taken by the Corps draws some controversy. In almost every decision to divert floodwaters, there are winners and losers. With the opening of the Bonnet Carre spillway, John Lopez of the Lake Pontchartrain Basin Foundation says the loser will be the lake. Within a few days, the brackish waters of the lake will be flushed out and replaced by nutrient-rich freshwater from the Mississippi. That will likely drive out the crabs and fish that normally call the lake home, and also promote algae blooms. A list of some of the worst episodes since 1900. 1900 – In September, a hurricane hit Galveston, Texas. The storm surge killed more than 6,000 people, making it the worst natural disaster in U.S. history. 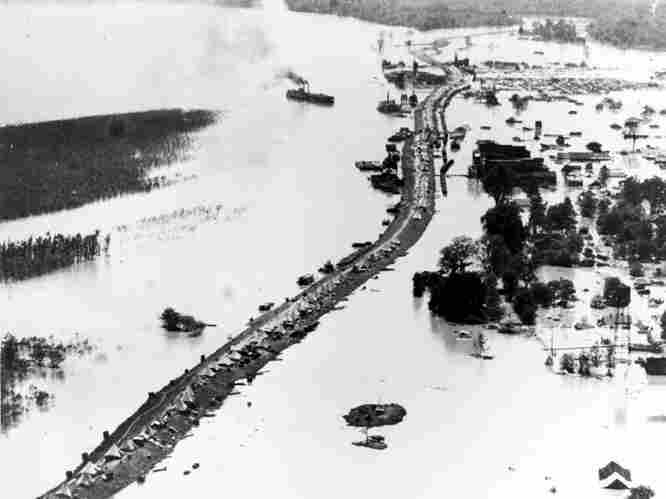 1927 – Floodwater inundated the lower Mississippi Valley, covering more than 16 million acres in multiple states. Between 250 and 500 people were killed, and more than 500,000 were forced to live in refugee camps. Because a levee constructed by the Army Corps of Engineers collapsed, the Corps revisited its levee policy. Congress approved the new plan under the 1928 Flood Control Act. 1951 – Rainfall in the Great Plains caused the Kansas River to overflow levees in Kansas and Missouri. Roughly 2 million acres were flooded. 1969 – Severe thunderstorms moved across north-central Ohio after July 4 celebrations began to wind down. Rainfall reached 10 to 14 inches in some areas, and several dams failed. As many as 500 people were injured, and 10,000 homes were damaged. 1972 – Fifteen inches of rain in five hours caused a flash flood in Rapid City, S.D., killing 237 people. 1993 – The Great Flood of 1993 inundated more than 20 million acres in nine states. 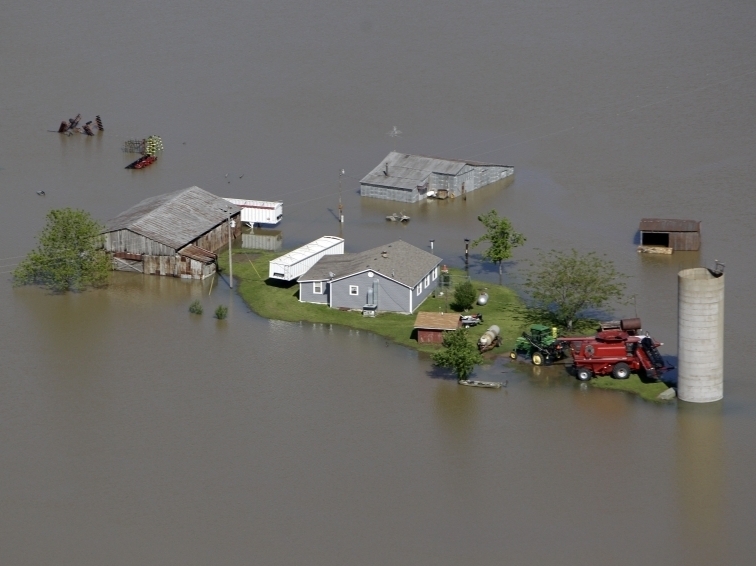 Hundreds of levees failed along the Mississippi and Missouri rivers. Damages totaled $15 billion to 20 billion. 2005 – Hurricane Katrina's storm surge overwhelmed the levees and floodwalls surrounding New Orleans. In 2006, the Army Corps of Engineers concluded the levees failed because they were built with inadequate designs and data. The final death toll was 1,836 people. "The blooms can lead to low oxygen — anoxia or hypoxia in the lake," Lopez says. "There have been times when there has been some relatively minor fish kills." Because of the danger and potential damage posed by the rising waters of the Mississippi, Lopez says his group doesn't oppose opening the spillway. It's a system, controlled by floodgates, that has been opened sporadically over the years. It's a much different situation from the floodway activation last week in southern Missouri. 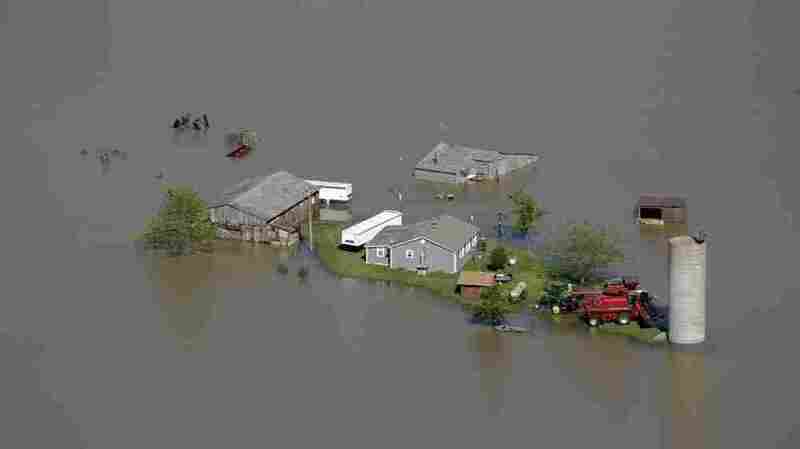 Over the course of four days, the Army Corps of Engineers blasted three openings in levees on the Birds Point floodway. It helped protect communities downstream and almost immediately reduced the level of the river by a couple of feet. But, in doing so, it flooded some 130,000 acres of farmland and forced the evacuation of 100 homes. Army Corps of Engineers Maj. Gen. Michael Walsh said deciding to activate the floodway was not something he did lightly. At a news conference, he said, "I've known many of the people who have lived and worked in the floodway for the past three years. I consider them friends, and certainly making the decision to put this in operation was a difficult decision." One reason farmland near the Mississippi is so productive is precisely because it has received regular flooding from the river. Activating the floodway was part of a plan that has been part of the Mississippi's flood control design for more than 80 years. But although it has long been in place, it has rarely been used. The last time was 74 years ago. At that time — as at this time — the decision was met with protests and lawsuits. Charles Camillo, a historian with the Mississippi River Commission, has studied transcripts of the congressional hearings after the historic 1927 Mississippi flood that led to the creation of the current flood control plan. Even then, there was opposition. Camillo says, "It was best characterized by Congressman Dewey Short. He said, 'The people of Southeast Missouri do not want to become the dumping grounds to protect Cairo, Ill., as much as we love Cairo, Ill.' "
Craig Colten, a professor of geography at Louisiana State University, says that for the Army Corps of Engineers, controversy comes with the territory. "Whenever you build structures to handle floods, you're walking that fine line between offering protection and failing to provide protection," Colten says. The Corps, he says, "is going to be a lightning rod for any either failures, or even successes, that on a rare occasion cause damage." For the Army Corps of Engineers, any criticism it faces over how it's handling flooding on the Mississippi pales in comparison with the public scourging it received following Hurricane Katrina. The Corps was targeted by many as the responsible party for the failure of New Orleans' levees — sharing the blame with local governments and contractors who performed substandard work. In the nearly six years since, the Corps has done much to upgrade flood control — and its image — in New Orleans. Among the changes he sees in the Corps post-Katrina, Colten says, it is careful now to downplay the level of protection provided by its flood control efforts. "They're trying not to present their levees as infallible and as providing 100 percent protection," he says. "They perhaps exhibit a little less hubris than they did in the past." As the Mississippi flooding moves downriver, the Army Corps of Engineers says some areas may even exceed levels seen in the historic 1927 flood. It's a reminder and a warning that even with the best flood control measures, living next to the river means sometimes getting wet.